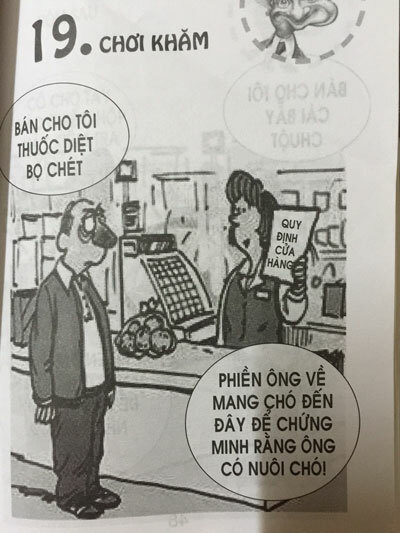 VietNamNet Bridge – Educators have expressed deep concern about children’s books with nonsensical content which are sold at many shops in the country. Vietnamese parents like to buy books that teach life skills and are entertaining for their kids, because they believe modern children are stuffed with too much academic knowledge. And they have many choices as numerous such books have hit the market. Mai Lan, a parent in Thanh Xuan district in Hanoi, said she panicked when reading ‘Do vui can nao’ (brainstorming quiz) from the Culture & Information Publishing House. Lan also pointed out a lot of other questions and answers which provide ‘anti-scientific’ and ‘anti-educational’ solutions. “How do you measure the height of a big tree without having to climb into the tree?” The book ‘advised’ children to chop down the tree for easy measuring. Hoang Thanh Hoa, a parent in Cau Giay district, said she was very disappointed about a book from the Fine Arts Publishing House. “Whose teeth are the whitest?” “The black people’s” was the answer. “It is management agencies which have to take responsibility for the books,” she said, adding that no relevant agencies had expressed their opinion about the cases. Dr. Nguyen Tung Lam, a renowned educator in Hanoi, commented that children were surrounded by numerous rubbish books. “It is necessary to eliminate the books from the market and to establish strict censorship at publishing houses to be sure that such books cannot hit the market,” he said. Dr. Vu Thu Huong, a lecturer at the Hanoi University of Education, said the situation was “worrying”. 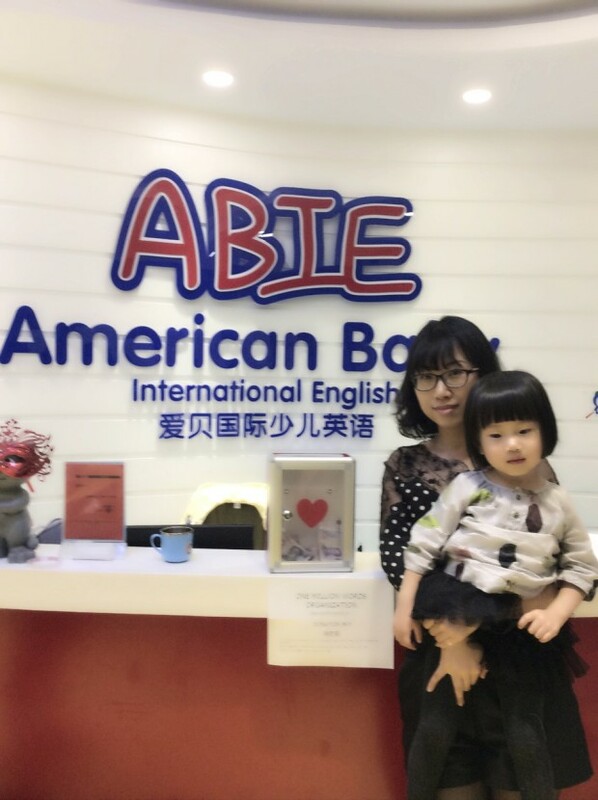 The books with nonsensical content would spoil children, while parents nowadays are too busy to spend time to choose the right things for their children to read she said. As the world marks the 48th annual International Literacy Day on Tuesday, have a look at how children in Vietnam and several Asian countries go to school in this photo feature provided by World Vision Vietnam. Millions of children across Asia returned to school this month, pursuing their right to education. The new school year in Vietnam officially kicked off on September 5. While many have schools in their own communities, others have to go on long and difficult journeys to access their education, which is a major challenge in Asia and the Pacific. In remote villages, schools are often far away and difficult to reach. The distance from home to school is one of the reasons why 26.3 million children are out of school in Asia and the Pacific, according to UNESCO. “On World Literacy Day, we are celebrating the children who embark on extreme, sometimes dangerous, journeys to school, so that they can learn and continue their education,” World Vision, a global relief and development organization, said. Here is how kids in remote areas in Vietnam and some other Asian countries make it to pursue literacy. September 8 was proclaimed International Literacy Day by UNESCO in 1965. It has been celebrated around the globe annually since 1966, with an aim to remind the international community of the status of literacy and adult learning globally. The theme of the 2015 International Literacy Day is “Literacy and Sustainable Societies,” according to UNESCO. World Vision, which is dedicated to helping children and their communities worldwide reach their full potential by tackling the cause of poverty, started working in Vietnam with emergency relief assistance in 1988 and opened an office in Hanoi in 1990. I left a 30-year career in for-profit education with hopes of changing the future for the world’s most vulnerable young students. Bringing quality education to all, the mission driving Pencils of Promise, may be the most challenging work with the highest stakes I have ever taken on. Later this month, the United Nations will convene to celebrate its 70th anniversary, working toward a compelling vision for sustainable development as articulated in its goals (SDGs) for people, planet, prosperity, peace and partnership. By necessity, the group’s policy lens will focus on the highest level and set inspirational goals from which individual countries can begin to shape more specific targets. Thankfully, this broad, diffuse light brings attention and awareness to a pervasive need — 250 million children worldwide lack basic reading, writing and numeracy skills. One in three of our planet’s youth fall far short of achieving literacy levels necessary to complete primary education, progress to secondary education and rise above a subsistence economy. Achieving SDG 4 — “ensure inclusive and equitable quality education and promote lifelong learning opportunities for all” — requires two breakthroughs. First, we must define and achieve higher quality. Then, we must find effective means to reach every child, to satisfy the “for all” component. I lead Pencils of Promise (PoP), a small, innovative NGO focused on bringing quality education to rural communities in Ghana, Guatemala and Laos. We live and breathe education, especially “for all.” Impact and return on donor’s dollars necessitate that we adopt a rigorous, hypothesis-driven, trial-and-error approach to identifying what works. Over the past year in Ghana, we implemented programming — including teacher training and e-readers for every student — designed to boost literacy rates. The results showed that 89 percent of sixth-grade students receiving PoP programming achieved benchmark literacy proficiency, versus 56 percent in a control group. This coming year, we will scale this programming to reach more communities and further validate outcomes. Partnership. Faced with deep need, there is a tendency to act. Instead, we ask first, act later. We ask governments and people what they need most, where and why. We trust but verify — with frequent visits to validate need and evolving conditions. Teachers, students and communities are receptive to PoP because of our authentic, equal partnership with local communities, national Education Ministries and regional governments. We do together what no one partner could achieve alone. Accountability. We don’t believe in handouts. Instead, we hold partners accountable for their contribution to a school, before we make ours. PoP builds primary schools for entire communities, for all students and parents to share and feel ownership. Transparency. We continue working in communities after we build a school to implement water, sanitation and hygiene programs as well as literacy-boosting technology and teacher support. Being there allows us to frequently collect data and share it with our stakeholders. As a result, 100 percent of the 304 schools that we’ve built are operating — no incomplete builds, re-purposed buildings or failed schools here. Local. At PoP, we empower and encourage local staff. Each of our Country Directors knows their country best — our role is to support their visions, not impose our own. PoP team members speak the native languages of communities, spend months there during the school builds and visit at least monthly thereafter. Quality education takes time and persistence. This post is part of a series produced by The Huffington Post, “What’s Working: Sustainable Development Goals,” in conjunction with the United Nations’ Sustainable Development Goals (SDGs). The proposed set of milestones will be the subject of discussion at the UN General Assembly meeting on Sept. 25-27, 2015 in New York. The goals, which will replace the UN’s Millennium Development Goals (2000-2015), cover 17 key areas of development — including poverty, hunger, health, education, and gender equality, among many others. As part of The Huffington Post’s commitment to solutions-oriented journalism, this What’s Working SDG blog series will focus on one goal every weekday in September. This post addresses Goal 4. They’re a local non-profit who pride themselves on providing foundational support and educational programs for the people of Guam. One such program empowers the family through literacy. The first classroom for any child is at home, but what if mom and dad weren’t equipped to be teachers? That’s what MotherRead is for. She adds that it’s a program that’s been ongoing for the last 13 years, and it shouldn’t be exclusive to women participants. For men out there, MotherRead is also known as FatherRead. 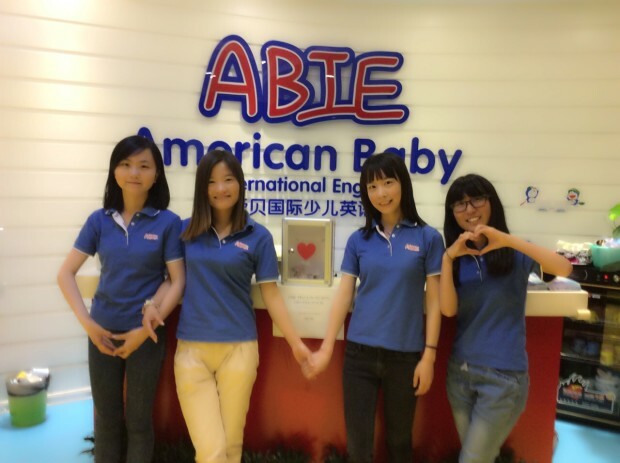 “We work with disadvantaged community members. So those who are incarcerated. We work with single parents. We work with socioeconomic disadvantaged community members. We work with English language learners. So a whole range of community members we try to serve through the program,” said Kihleng. For more information on how to apply, call Flores at 472-4468. Waterbury Center, VT: Eight elementary schools throughout New Hampshire and Vermont are celebrating, because each has been awarded a special literacy sponsorship valued at $25,000 for the 2015/2016 school year from the Children’s Literacy Foundation (CLiF), an independent nonprofit based in Waterbury Center, VT.
Each school given a special CLiF Year of the Book sponsorship will receive a wide range of inspiring literacy programs and events for the students and parents throughout the school year, and new children’s books for the school library, school classrooms, public library, and students. Kickoff events start this week and continue through September. These schools are Central Elementary School in Bellows Falls, Lothrop Elementary School in Pittsford, Newport Town School, and South Royalton School in Vermont. New Hampshire schools are Groveton Elementary School, Paul Smith School in Franklin, Richards School in Newport, and Wentworth Elementary School. In these communities, the CLiF Year of the Book is introduced with a special literacy and storytelling presentation during the first weeks of school. Students and staff also learn about upcoming events that may include: writing workshops with poets, children’s authors, and cartoonists; presentations by well-known authors about how books and stories are created; theater performances; visits from naturalists with sled dogs or reptiles in projects related to writing about animals; seminars to help and encourage parents to read more with their children; and up to 10 free, brand new books that each child may select and keep. CLiF will begin accepting applications for 2016-2017 Year of the Book grants from New Hampshire and Vermont elementary schools in January, 2016. For more information about the CLiF Year of the Book and to see a schedule of CLiF Year of the Book kickoff events, visit www.clifonline.org. SIR: In the words of former United States of America President, Bill Clinton, during the celebration of International Literacy Day in 1994, “literacy is not a luxury; it is a right and a responsibility. If our world is to meet the challenges of the twenty-first century we must harness the energy and creativity of all our citizens.” Available data indicates that there are now close to four billion literate people in the world. Inasmuch as this represents a positive stride, literacy for all is still a yet-to-be-accomplished objective. Recent UNESCO statistics show that 774 million adults still cannot read or write – two-thirds of them (493 million) are women. Among youth, 123 million are illiterate of which 76 million are female. In Nigeria, in-spite of efforts by all tiers of governments to address rising illiteracy level, there has not been a progressive increase in the literary level, especially among the adults. According to the National Bureau of Statistics, adult illiteracy rate in Nigeria stands at 56.9%. The implication of this is that about 70% of Nigerians are illiterates. Considering the fact that globally the illiteracy rate is approximately 20%, the Nigerian situation is rather disturbing. The Country Comparison Index of Literacy Level by country in 2012 further testifies to the worrisome literacy situation in the country as it shows that Nigeria ranked 161 out of 184 countries with 66 per cent literacy rate. This implies that we belong to the mainstream of the world’s most illiterate countries. A recent USAID study also indicates that an estimated 10 million Nigerian children are not registered in school. A disclosure by a former Minister of State for Education, Chief Nyesom Wike, equally indicates that the number of adults who cannot read and write in the country is estimated at 60 million, which is about 38% of the country’s population estimated at 170 million. The revelation was made by Wike at the flagging off of the 2014 International Literacy Day. The declining fortune of literacy ratio among Nigerian children is, indeed, an embarrassment to the nation as we currently have over 10.5 million children out of school. The current Education for All, EFA, Global Monitoring report ranks Nigeria as one of the countries with the highest level of illiteracy. The EFA report on Nigeria affirmed that the number of illiterate adults has increased by 10 million over the past two decades, to reach 35 million. The current literacy trend in Nigeria, if not speedily halted, could obstruct the attainment of the Millennium Development Goals (MDG’s). As it has been earlier asserted, literacy is vital to the achievement of every growth index. The way things stand, the objective of meeting the national mark of reducing illiteracy by 50% by 2015 seems largely unattainable. To successfully confront poverty, disease, religious fanaticism, political chaos, ethnic bigotry, gender discrimination, economic depression among others, efforts must be made by all to enhance the literary level in the country. Importantly, governments at all levels need to make pragmatic legislation as well as improved funding for the relevant agencies of government saddled with the execution of the mass literacy programme. Equally, literacy inclined groups and other related NGOs ought to step up activities and campaigns to increase awareness of the importance of literacy. The various States Universal Basic Education Boards, SUBEB, need to intensify efforts to ensure that no child is left out in the mass literacy drive. To this end, all the states need to strictly adhere to the spirit and principle of the Child Rights Law which criminalizes denial of access to any child to school. The general perceptive of literacy is ability to read and write. But, literacy has bigger dimensions than mere ability to read and write. According to former United Nations Secretary General, Dr Kofi Anan, “Literacy is a bridge from misery to hope. It is a basic tool for daily life in modern society. It is a wall against poverty, and a building block of development. Literacy is a vehicle for the promotion of cultural and national identity”. September 8 is globally celebrated as International Literacy Day. It is a day set aside to draw attention to the importance and impact of literacy skills on individuals, communities, and societies. Since the day was first celebrated in 1966, on every 8 September, the United Nations Educational, Scientific and Cultural Organisation, UNESCO, requests governments, employers, trades unions and other key global organisations to get involved and appreciate the importance of being able to read and write. In countries all over the world, the International Literacy Day raises people’s awareness of and concern for literacy issues within their own communities. Several activities relating to concerns over low literacy levels have taken place as a result of this increased awareness. Some of these activities include literacy day projects, particularly with regard to technology and literature, which are promoted by various organisations, including reading associations. CORNWALL, Ontario – Switch off the television and crack open a book (or power up your eReader) for International Literacy Day this Tuesday. © Adam Brazeau – The Cornwall Public Library. The Cornwall Public Library encourages the community to drop by and visit during the annual literacy initiative to read, go online, or browse the used bookstore. According to its website, International Literacy Day gives children and communities a chance to rediscover the joys of reading while raising awareness for those without access to education. Dawn Kiddell, the library’s CEO and chief librarian, noted that the one-day event is a reminder of how fortunate many Canadians are to have access to education, literacy organizations, and a public library service. With a library card, members are able to borrow books, CDs, DVDs, magazines, and video games; search research databases; read online magazine and newspaper articles; use computers; register in various programs; and can download eBooks and eAudiobooks. The library also offers early childhood literacy-based programs – Baby Tales, Time for Twos, Kid’s Corner and the Summer Reading program (with over 300 children participating this year). In addition, there are adult book clubs, writer’s groups, writer’s workshops, author presentations, and tutoring space for literacy learners. In 2014, the downtown facility had 208,390 in-person visitors (which averages 17,366 per month or 579 per day). Cardholders borrowed a total of 263,692 items (93% of which were print books, CDs or DVDs and 7% were eBooks or eAudiobooks). In July, 17,983 people visited and another 15,746 used the website to search the library catalogue, renew or reserve their books, search the research databases or get information about library programs, while information staff answered a total of 3,127 questions, 2,315 computer reservations were made, and another 498 people accessed the free wireless. For more information, visit library.cornwall.on.ca. 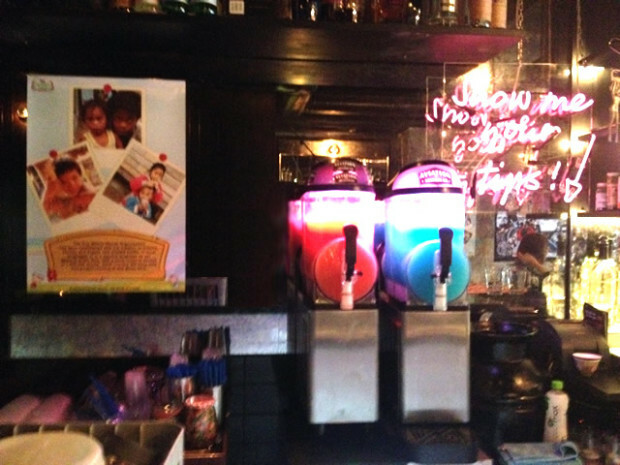 One Million Words was happy to be selected as the recipient of the Pontiac Bar’s and US based Aviator Gin’s 4th of July fundraising event in Hong Kong. 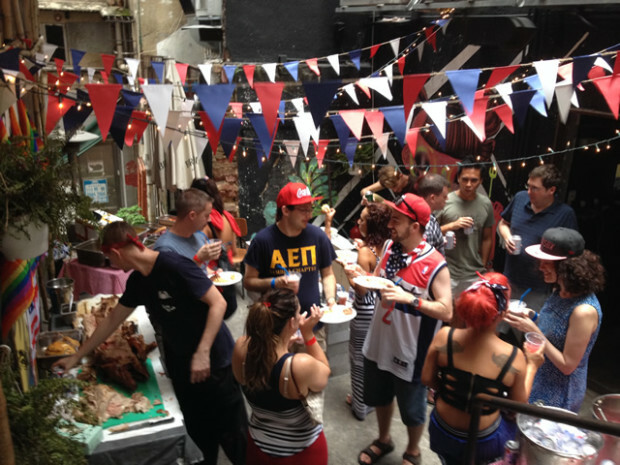 Around 100 people came to enjoy great music, food, drinks, and to celebrate US Independence Day and the passing of the new marriage equality act. One Million Words was selected as the charity of choice due to the participant’s interest in equal rights around the world and the importance of literacy and education in making this a reality. We would sincerely like to thank everyone that came and donated to help this cause, and of course to wish everyone a happy 4thof July. Also, a very special thank you to The Pontiac and Aviator Gin for selecting us as their donation recipient! We are constantly in touch with the SenJiMeiDuo school, and we have let them know of your kindness and support, so they wanted us to pass along a big THANK YOU from all of the students, teachers, and volunteers that help there. 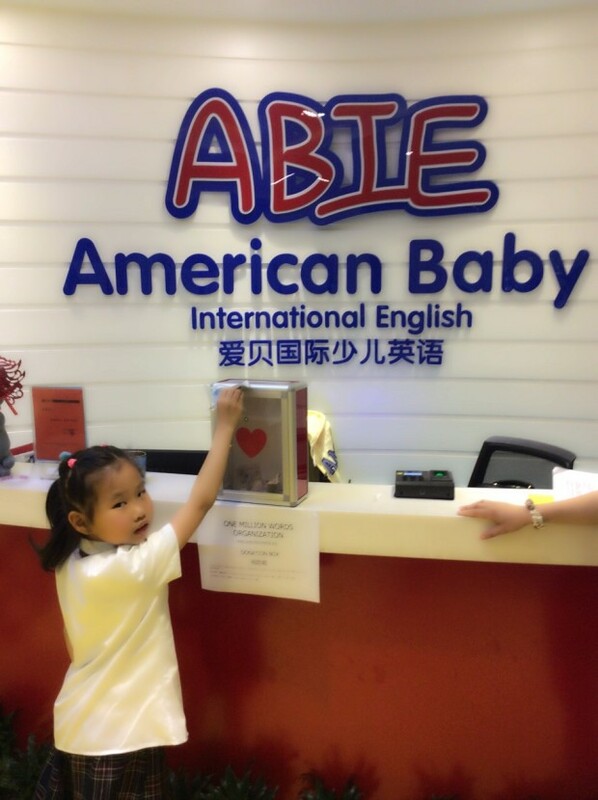 American Baby International English (ABIE) in Shanghai, China setup a donation box in the schools campus to raise funds for the “Give the Gift of Literacy – Tibetan Charity School” Indiegogo fundraiser campaign. With both staff and students donating money funds for our projects are really rising fast, both online and offline. 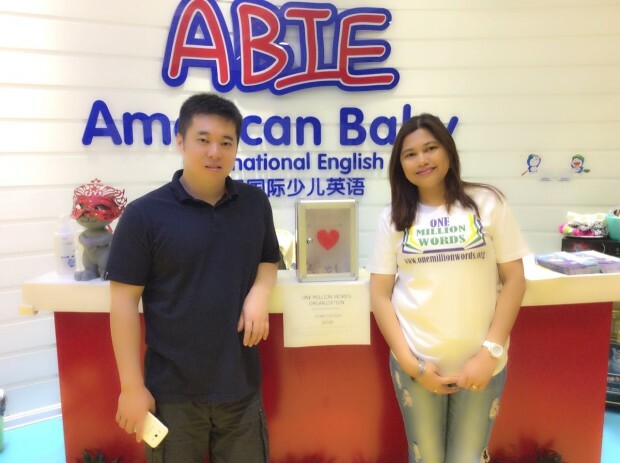 The school owner, Andy, above with Ms Calope from OMW China, said we just wish we could do more to help and it is our great pleasure to have ABIE involved in with the work that One Million Words does for our country. Senjimeiduo Tibetan Charity school thanking One Million Words for the STAGE 1 of the donation.